Abstract: In this study, nanoparticles (NPs) of poly(lactic-co-glycolic acid) (PLGA) loaded with fluconazole (FLZ) and FLZ-NPs coated with the cationic polymer polyethylenimine (PEI) (FLZ-NP-PEI) were synthetized in order to improve antimycotic activity against four strains of Candida spp. of clinical relevance. FLZ-NPs and FLZ-NP-PEI were synthesized by double emulsion solvent-diffusion (DES-D) and characterized. Minimum inhibitory concentration (MIC50) and minimum fungicide concentration (MFC) were determined in vitro by culturing Candida strains in the presence of these nanocompounds. FLZ-NPs were spherical in shape with hydrodynamic sizes of ~222 nm and surface charge of -11.6 mV. The surface charges of these NPs were successfully modified using PEI (FLZ-NP-PEI) with mean hydrodynamic sizes of 281 nm and surface charge of 23.5 mV. The efficiency of encapsulation (~53%) and a quick release of FLZ (≥90% after 3 h) were obtained. Cytotoxicity assay showed a good cell viability for FLZ-NPs (≥86%), and PEI-modified NPs presented a decrease in cell viability (~38%). 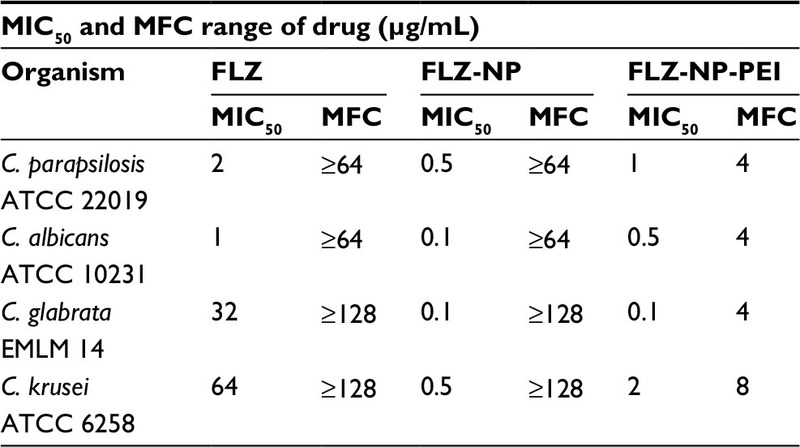 FLZ-NPs showed an increasing antifungal activity of FLZ for sensitive (Candida parapsilosis ATCC22019 and Candida albicans ATCC10231, MIC50 =0.5 and 0.1 µg/mL, respectively) and resistant strains (Candida glabrata EMLM14 and Candida krusei ATCC6258, MIC50 =0.1 and 0.5 µg/mL, respectively). FLZ-NP-PEI showed fungicidal activity even against C. glabrata and C. krusei (MFC =4 and 8 µg/mL, respectively). MIC50 values showed best results for FLZ-NPs and FLZ-NP-PEI. Nevertheless, only FLZ-NP-PEI displayed fungicidal activity against the studied strains. In this study, we used a novel NP preparation technique, double emulsion solvent-diffusion (DES-D) method,43 to load FLZ in a polymeric matrix of PLGA (FLZ-NP); it has also been explored as a method for surface charge modification of FLZ-NPs using a cationic polymer such as PEI as a strategy to enhance its antifungal activity. Physicochemical properties of both conventional NPs (FLZ-NPs) and the cationic NPs (FLZ-NP-PEI) were studied and tested on four Candida species of clinical relevance. FLZ (≥98%), PLGA 50:50 (molecular weight [MW]: 38,000 Da), poloxamer 407 (POL), and PEI in solution at 50% (w/v) (MW: 2 kDa) were purchased from Sigma-Aldrich (USA). Ethyl acetate (EtAc; 99.5+%) was acquired from Alfa-Aesar (USA). Cell viability was assessed using the 3-[4,5-dimethylthiazol-2-yl]-2,5-diphenyltetrazolium bromide (MTT) assay in Hank’s balanced salt solution (HBSS) on Vero (ATCC) cell line maintained in Eagle’s minimum essential medium (EMEM). Finally, for the in vitro antifungal activity, the following fungal strains were used: C. glabrata EMLM 14 and C. albicans ATCC 10231, which were gifted by Escuela de Microbiología of the Universidad Industrial de Santander (Bucaramanga, Colombia); C. parapsilosis ATCC 22019, which was purchased from Microbiologics and C. krusei ATCC 6258, which was obtained from Laboratorio de Quimioterapia Antifúngica of the Universidad de Sao Paulo (Sao Paulo, Brazil). All fungal strains were maintained in solid media using Saboraud dextrose agar (SDA). This project had the approval of the Ethics Committee of the Industrial University of Santander, and complied with the biosafety regulations stipulated in title 4, chapter 1 of the resolution 008430 of 1993 of the Ministry of Health of the Republic of Colombia. FLZ was encapsulated using PLGA utilizing the DES-D methodology,43 with some modifications. 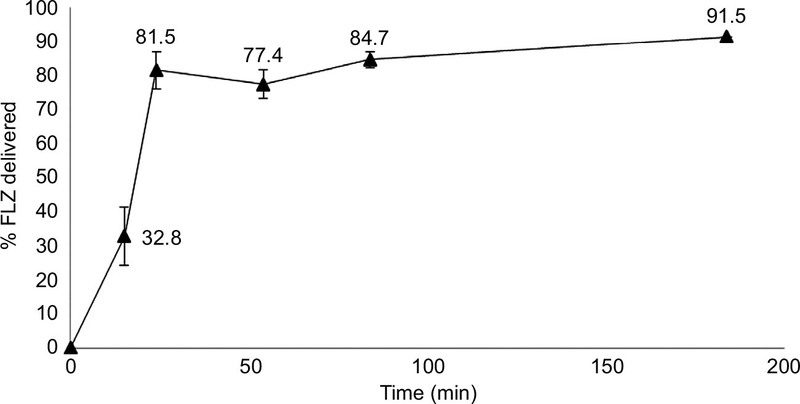 Two milliliters of 5 mM phosphate buffer, pH =7.4, with 5 mg/mL of FLZ, was emulsified in 4 mL of EtAc containing 3% (w/v) PLGA (50:50) using a homogenizer–disperser (IKA Ultra-Turrax T-18), at 20,000 rpm for 30 s. The resultant solution was again emulsified at 20,000 rpm for 30s with 10 mL of 5 mM phosphate buffer, pH =7.4, containing 2% (w/v) POL. EtAc was eliminated by evaporation at 100 mbar for 20 min using a rotatory evaporator (Hei-VAP Precision; Heidolph). For eliminating the free and residual FLZ produced from NP synthesis, we centrifuged NPs containing FLZ (FLZ-NP) at 12,500 g in a centrifuge (IEC CL31R Multispeed; Thermo Fisher Scientific) for 15 min at 4°C. Then, they were resuspended in 5 mM phosphate buffer, pH =7.4. This procedure was repeated three times. Efficiency of FLZ encapsulation was analyzed according to Rivera et al. One milliliter of FLZ-NP was dried using a rotatory evaporator at 100 rpm, 80 mbar for 20 min. The pellet formed was dissolved in 3 mL of dichloromethane (DCM) and stirred at room temperature. This sample was analyzed spectrophotometrically at λ=260 nm (UV-1800; Shimadzu), and the amount of FLZ was determined using a calibration curve of FLZ dissolved in distilled water.46 Efficiency of FLZ encapsulation was defined as ratio between encapsulated FLZ and total amount of FLZ added at the beginning of the preparation.47 These tests were performed in triplicate (n=3). One milliliter of FLZ-NP was diluted in 50 mL of water Milli-Q; this sample was stirred in an orbital shaker (MaxQ 4000; Thermo Fisher Scientific) at 37°C, 50 rpm. Periodically, samples from the suspension (0.5 mL) were withdrawn and centrifuged at 16,000× g for 10 min in Amicon Ultrafilter Tubes (molecular weight cutoff: 30,000 Da) and spectrophotometrically analyzed at λ=260 nm.43 This assay was performed in triplicate (n=3). An amount of FLZ-NP solution was mixed with PEI for the modification of surface charge according to the protocol described by Liang et al.34 PEI was added at varying concentrations from 0.005 up to 0.1% (w/v). The pH was adjusted to 7.4 utilizing 0.1 N HCl, and then, the solutions were shaken under magnetic stirring for 3–4 h. FLZ-NPs modified with PEI (FLZ-NP-PEI) were centrifuged at 12,500× g for 15 min at 4°C and then resuspended in 5 mM phosphate buffer solution, at pH =7.4, three times (3×), in order to eliminate the excess PEI. Finally, measurements of surface charge and size were performed in triplicate by DLS and LDE. Vero cell line (African green monkey kidney, ATCC N° CCL-81) viability with and without treatment with different preparations of FLZ was determined by using of MTT methodology as described by Mossman.48 In brief, Vero cell line, maintained in EMEM supplemented with 10% fetal bovine serum at 37°C in 5% CO2 atmosphere, were seeded at 1×104 cells/mL in a polystyrene flat-bottomed 96-well plate; after 24 h of incubation, these cells were treated with serial dilutions (0, 5, 1, 2, 4, 8, and 16 µg/mL) of NP, NP-PEI, FLZ-NP, FLZ-NP-PEI and also with PEI alone at different concentrations (2, 6, 8, 10, 20, and 40 µg/mL). After 48 h of incubation, the supernatant was discarded, 200 µL of MTT (500 µg/mL in HBSS) reagent was added to each well and was further incubated for 3 h, the supernatant was discarded, and the formazan crystals formed inside the cells in each well were solubilized with 200 µL of dimethyl sulfoxide (DMSO). The absorbance at 550 nm of each well in the plates was read immediately in a microplate reader (Multiskan™ GO Microplate Spectrophotometer; Thermo Fisher Scientific). Wells with DMSO without cells were used as blanks. The inhibitory concentration (IC50) was defined as the compound concentration reducing 50% cell line viability.49 All the experiments were conducted in triplicate. The results were presented as mean ± SD. The viability of cells cultured without NPs was considered 100%. Determination of in vitro antifungal activity of FLZ, FLZ-NP, and FLZ-NP-PEI against Candida spp. The inhibitory effect of FLZ, FLZ-NP, and FLZ-NP-PEI was determined according to the standard culture microdilution method (M27-A3) from Clinical and Laboratory Standard Institute (CLSI).50 Candida spp. strains were cultivated in synthetic RPMI 1640 medium supplemented with l-glutamine and 0.2% (w/v) d-glucose without sodium bicarbonate (Sigma-Aldrich Co., St. Louis, MO, USA), buffered with 0.1654 M 3-(N-morpholin)-propane-sulfonic acid (MOPS), adjusted at pH 7±0.1. Inocula from Candida spp. strains were obtained from fungal cultures in SDA at 35°C for 24 h. The initial concentration of Candida spp. strains was 1–5×106 CFU/mL. The inocula were adjusted in order to obtain an optical density of 0.5 in the McFarland scale using a sterile 0.85% (w/v) saline solution. Finally, cells were suspended in RPMI 1640 medium in order to obtain a final concentration of 5×103 CFU/mL. For the evaluation of antifungal activity, we tested FLZ, FLZ-NP, FLZ-NP-PEI, empty NPs, and NP-PEI against strains of C. parapsilosis, C. albicans, C. glabrata, and C. krusei cultured in 96-well microplates at different concentrations at 35°C for 48 h. Growth and sterility controls were also used. Fungal growth was determined in an Enzyme-Linked ImmunoSorbent Assay Microplate Reader (iMarck; Bio-Rad Laboratories, Hercules, CA, USA) at 530 nm. Minimum IC (MIC50) was defined as the lowest concentration of FLZ, FLZ-NP, and FLZ-NP-PEI that produces a reduction of 50% of the yeast growth compared to controls (in the absence of compounds). 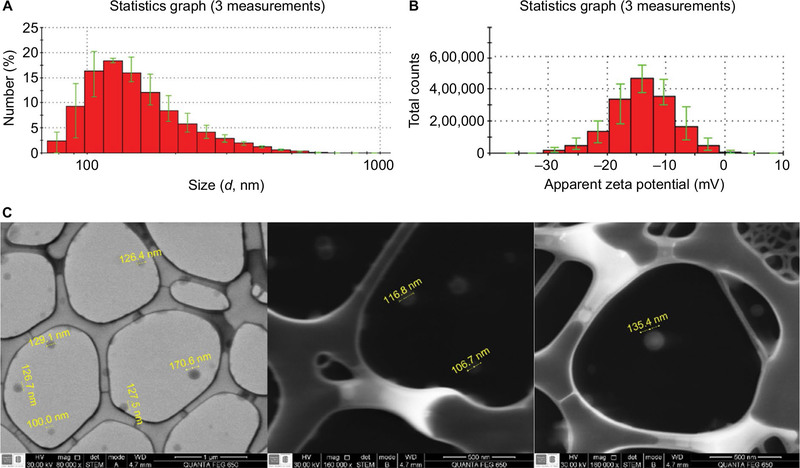 FLZ-NPs were characterized by DLS, LDE, and SEM, determining hydrodynamic size, zeta potential, and morphology of NPs (Figure 1). PGLA NPs loaded with FLZ (FLZ-NPs) showed the mean size of ~222±2.4 nm with a polydispersity index (PDI) of <0.2 (0.156), indicating a narrow particle distribution (Figure 1A). The mean zeta potential was ~–11.6±5.13 mV (Figure 1B). SEM images (Figure 1C) of the FLZ-NPs showed that the mean size of the NPs was ~156±97 nm and they were monodispersed, with spherical morphology and without aggregation among NPs, indicating stability and low dispersion between NPs. Figure 1 Characterization of FLZ-NPs synthesized by DES-D methodology. Notes: (A) Size distribution was measured by DLS. (B) Zeta potential measured by LDE at pH =7.4. (C) Images of SEM (80,000× and 160,000×). Abbreviations: DES-D, double emulsion solvent-diffusion; DLS, dynamic light dispersion; FLZ, fluconazole; LDE, laser Doppler electrophoresis; NPs, nanoparticles; SEM, scanning electron microscopy. 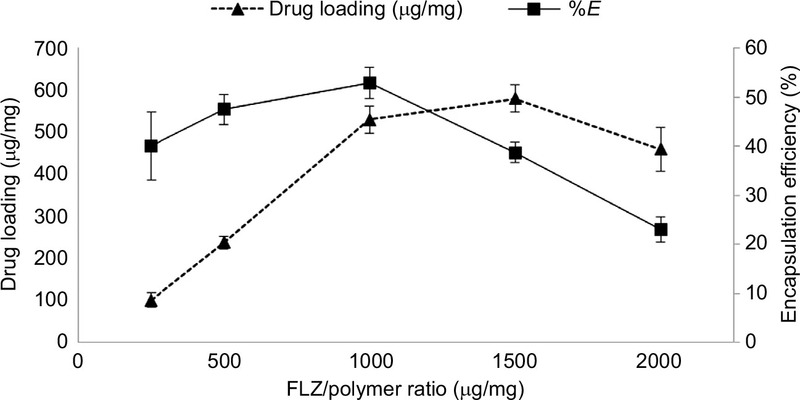 A set of experiments was carried out at varying drug/polymer ratios from 250 up to 2000 µg FLZ/mg PLGA (Figure 2). The preparation of 1000 µg/mg achieved the best encapsulation efficiency (53%) with a drug loading of 530 µg FLZ/mg PLGA. Although the preparation of 1500 μg / mg obtained the maximum FLZ loading (580 μg / mg), a low encapsulation efficiency (38%) was observed; this measurement was performed with freshly synthesized NPs. Figure 2 Effect of FLZ/PLGA ratio on encapsulation efficiency of FLZ. Note: Data represent mean ± standard deviation (n=3). Abbreviations: FLZ, fluconazole; PLGA, poly(lactic-co-glycolic acid). A suspension of freshly synthesized FLZ-NPs was diluted in 50 mL of 5 mM phosphate buffer solution adjusted at pH 7.4 and incubated at 37°C for 4 h under sink conditions in order to avoid interference of the pharmaceutical solubility with its delivery in vitro.17,52 A quick release of FLZ was observed in the first 24 min (81.5%), achieving an almost complete release of FLZ (≥90%) after 3 h (Figure 3). Figure 3 Cumulative release of FLZ from PLGA-NPs in vitro (one suspension of FLZ-NPs was diluted 1:50 in 5 mM phosphate solution, pH: 7.4, 37°C). Abbreviations: FLZ, fluconazole; NPs, nanoparticles; PLGA, poly(lactic-co-glycolic acid). The size and superficial charge of FLZ-NPs ranged from 210±4.4 nm and -9.93±1.5 mV, respectively. An increase in the size of NPs was observed when PEI was added, obtaining FLZ-NP-PEIs with the mean size of ~281±6.6 nm. In addition, the increase in positive charge was significant at PEI concentrations of 10 and 20 µg/mL, with values ~11.9±1.2 and 23.5±1.3 mV, respectively. Interestingly, an increase in PEI concentration showed a diminishing positive charge of FLZ-NP-PEI resulting NPs. Vero cell line exposed to different concentrations of PEI presented a dose-dependent cytotoxicity that increased along with PEI concentration. The IC50 of PEI was estimated to be 10 µg/mL (Figure 4). NP and FLZ-NP showed no effect on cell viability at all tested concentrations even at 16 µg/mL, and the viability was 86±8 and 90±8%, respectively. In contrast, NPs functionalized with PEI (NP-PEI and FLZ-NP-PEI) showed a reduction in the viability of ~16% at the lowest concentrations of 0.5 and 1 µg/mL (81±12 and 76±15% cell viability, respectively) and at 4, 8, and 16 µg/mL (69±12, 63±14, and 62±10% cell viability, respectively); the difference was even higher ~26% compared with the NPs without PEI (NP and FLZ-NP). However, this effect was not directly concentration dependent (Figure 5). Figure 4 Vero cell viability by MTT assay after 48 h of treatment with different concentrations of PEI 2 kDa. Note: Each point is the mean ± standard deviation obtained from three distinct experiments for each concentration. Abbreviations: MTT, 3-[4,5-dimethylthia-zol-2-yl]-2,5-diphenyltetrazolium bromide; PEI, polyethylenimine. Figure 5 Cytotoxicity of NPs in Vero cell line by MTT assay. Notes: The cells were incubated with different concentrations of NPs, for 48 h. The values are given in reference to the control group that was cultured without the NPs, and it was considered to have 100% viability. Each bar is the mean ± standard deviation obtained from three distinct experiments for each concentration. Abbreviations: MTT, 3-[4,5-dimethylthia-zol-2-yl]-2,5-diphenyltetrazolium bromide; NP, nanoparticle; FLZ-NP, fluconazole nanoparticle; NP-PEI, Polyethylenimine nanoparticle; FLZ-NP-PEI, fluconazole polyethylenimine nanoparticle. Evaluation of antifungal effect of FLZ-NPs was evaluated by the determination of MIC50 and MFC values, following the methodology proposed by CLSI from document M27-A3 and Canton et al.50,51 We carried out respective controls for four species of Candida in absence of FLZ, the respective measurements were made at 24 and 48 h. We also tested the possible activity of NPs without FLZ (PLGA-NP and PLGA-NP-PEI) against Candida spp., showing no activity at the evaluated concentrations (≤64 µg/mL). Finally, we tested the effect of FLZ, as positive control, and the antifungal activity of FLZ-NPs and FLZ-NP-PEIs at varying concentrations from 0.1 up to 64 µg/mL (Table 1). FLZ-sensitive strains of C. parapsilosis ATCC 22019 and C. albicans ATCC 10231 were used as controls.53,54 Assays with FLZ obtained the MIC50 of 2 and 1 µg/mL for these strains, while assays with FLZ-NP obtained the MIC50 of 0.5 and 0.1 µg/mL for these strains, respectively, which indicates an increase of 4- and 10-fold in the antifungal activity of FLZ. In contrast, FLZ-NP-PEI obtained the MIC50 of 1 and 0.5 µg/mL for the same strains, respectively. FLZ-NP-PEIs showed a slightly lower effect on evaluated Candida spp. compared to FLZ-NPs. We also evaluated the activity of NPs on C. glabrata EMLM 14 and C. krusei ATCC 6258 strains with intrinsic and/or acquired resistant to FLZ and, in general, to azole antifungal drugs.2,14,15,55 MIC50 values for these strains using only FLZ were very higher, achieving 32 and 64 µg/mL, respectively. Regarding the MIC of FLZ, FLZ-NPs and FLZ-NPs coated with PEI showed a great activity against these strains. FLZ-NPs obtained the MIC50 values of 0.1 and 0.5 µg/mL, while FLZ-NP-PEI obtained the MIC50 values of 0.1 and 2 µg/mL. MFCs for four Candida spp. strains using free FLZ and FLZ-NPs did not show detectable activity; however, preparations of FLZ-NP-PEI were fungicidal even with resistant strains, obtaining the MFC of 4 µg/mL for C. glabrata and 8 µg/mL for C. krusei. Note: The possible action of empty NPs (NP and NP-PEI) against Candida spp. was also tested, showing no activity at the evaluated concentrations (≤64 µg/mL). Abbreviations: FLZ, fluconazole; MFC, minimum fungicide concentration; MIC50, minimum inhibitory concentration; NPs, nanoparticles; PEI, polyethylenimine. Using the DES-D method, NPs loaded with FLZ with a mean size of ~222±2.4 nm (Figure 1A), spherical morphology (Figure 1C), and PDI of <0.2 were obtained, suggesting that the technique of synthesis of NPs was reproducible and effective for the encapsulation of FLZ.32,56 Zeta potential measurements showed negative values (−11.6±5.13 mV), because at pH 7.4, carboxylic groups present in PLGA are highly dissociated. This surface charge is not sufficient to provide good stability of NPs,57 and it is possible that some aggregation or clustering among NPs could be produced at long term. These NPs were ~100 nm smaller and had 23% more drug loading than other methods of encapsulation of FLZ as previously reported.17 Although Rivera et al successfully synthesized PLGA microparticles loaded with FLZ using the spray drying technique, with higher encapsulation efficiency (98%) than reported in this study (53%), it was found that the amount of drug loaded affected greatly the size of the microparticles, obtaining a maximum drug/polymer ratio of 400 µg FLZ/mg and the size of ~2243 nm.46 In this study, we successfully achieved a higher drug/polymer ratio of 530 µg FLZ/mg PLGA with sizes ten times smaller. Superficial charge of NPs could play an important role in the potential antimicrobial activity. Positive charge >+15 mV can extend circulation times in bloodstream.60 In consequence, the modification of charge of PLGA NPs has been explored using PEI, which is the most prominent and extensively used cationic polymer. Figure 6 shows the effect of different concentrations of PEI on surface charge (ζ, mV) of NPs. In this study, higher cationic charges (23.5±1.3 mV) were obtained from 20 µg/mL of PEI. This is due to PEI, which is a cationic polyelectrolyte that is attracted to the anionic surface of PLGA by virtue of its charge in a purely electrostatic manner, a process known as nonspecific adsorption, and this could explain the increase in the size of NPs ~71±6 nm. However, at high PEI concentrations, we found a low zeta potential, probably due to a screening effect of the ions presented in the buffer that gradually reduces the zeta potential along with an increase in the PEI concentration. Figure 6 Effect of PEI concentration on size and zeta potential (ζ) of FLZ-NP dissolved in 5 mM phosphate solution, pH: 7.4. Abbreviations: FLZ, fluconazole; NP, nanoparticle; PEI, polyethylenimine. Vero cells incubated with different concentrations of FLZ-NPs showed an average cell viability of ~≥86% (Figure 5), indicating that PLGA NPs were nontoxic, suggesting that these NPs could be used as carriers for FLZ. In contrast, PEI-modified NPs decreased cell viability, up to 38%, compared with the control at the highest concentration. Despite the potential advantages of PEI to modify the NP surface charge, this cationic polymer showed high cytotoxicity in many cell lines depending on many factors, such as branching degree, molecular weight, particle size, and concentration,61 for example, the normal cellular process inhibition is due to the PEI ammonium group interaction with negatively charged biomolecules (including nucleic acids).62 Taking into account that branched low molecular weight PEI has shown more acceptable toxicity,63 a 2 kDa branched PEI was used to obtain the lower cytotoxicity. Indeed, the IC50 determined for PEI alone was ≥10 µg/mL, that is, half of the concentration needed to obtain the higher cationic charge of the NPs, 23.5±1.3 mV (20 µg/mL); this explains the increased cytotoxicity observed in the cationic NPs. However, this effect was neither as cytotoxic as the PEI alone nor showed a dose-dependent pattern (Figure 5). In contrast, studies with FLZ-NP-PEI achieved considerable fungicidal activity, even in the FLZ-resistant strains C. glabrata and C. krusei. This fungicide effect can be produced by an increase in electrostatic interactions between Candida and positive NPs (FLZ-NP-PEI), because Candida spp. has a negative superficial charge envelope.70 It is also possible that PEI acts on the cell membrane of the fungus, causing a change in the surface charge from negative to positive,71 and this combined with the drug could cause the decrease in the viability of the fungus. PEI can also induce ruptures on the cell membrane at nanometric scales. This effect could facilitate uptake of the drug in the cell, causing the fungicidal effect.35,72 Moreover, cationic NPs without drug (NP-PEI) showed no activity on the fungus, which may be due to the low concentration of PEI remaining on the surface of the NP after washing to remove the excess of polymer and this amount is not sufficient to cause a visible effect on the fungus. Polymeric NPs used in this study can be a viable alternative for improving the antifungal activity of FLZ against Candida spp., even in strains with intrinsic resistance against this antifungal. The use of PEI achieved to modify zeta potential of NPs, obtaining a nanocompound with great fungicidal activity; however, due to the inherent cytotoxicity of cationic polymers, such as PEI, cationic NPs showed a moderate toxicity against Vero cell line. In vitro activity of two types of NPs (FLZ-NP and FLZ-NP-PEI) was higher compared to free FLZ on four strains of Candida spp., indicating that these nanocompounds represent good candidates for further studies of antifungal activity in vivo. This study was funded by Vicerrectoría de Investigación y Extensión (VIE) from Universidad Industrial de Santander and Colciencias (Project Number: 8708). BSc fellowship from Colciencias and Universidad Industrial de Santander for GSN is gratefully acknowledged. Kumamoto CA. Inflammation and gastrointestinal Candida colonization. Curr Opin Microbiol. 2011;14(4):386–391. Pfaller MA, Diekema DJ. Epidemiology of invasive candidiasis: a persistent public health problem. Clin Microbiol Rev. 2007;20(1):133–163. Gudlaugsson O, Gillespie S, Lee K, et al. Attributable mortality of nosocomial candidemia, revisited. Clin Infect Dis. 2003;37(9):1172–1177. Marriott DJE, Playford EG, Chen S, et al. Determinants of mortality in non-neutropenic ICU patients with candidaemia. Crit Care. 2009;13(4):R115. Bassetti M, Taramasso L, Nicco E, Molinari MP, Mussap M, Viscoli C. Epidemiology, species distribution, antifungal susceptibility and outcome of nosocomial candidemia in a tertiary care hospital in Italy. PLoS One. 2011;6(9):e24198. Kett DH, Azoulay E, Echeverria PM, Vincent J-L. Candida bloodstream infections in intensive care units: analysis of the extended prevalence of infection in intensive care unit study. Crit Care Med. 2011;39(4):665–670. Edwards JE. Invasive Candida infections, evolution of a fungal pathogen. N Engl J Med. 1991;324(15):1061–1062. Wisplinghoff H, Bischoff T, Tallent SM, Seifert H, Wenzel RP, Edmond MB. Nosocomial bloodstream infections in US hospitals: analysis of 24,179 cases from a prospective nationwide surveillance study. Clin Infect Dis. 2004;39(3):309–317. Bouza E, Muñoz P. Epidemiology of candidemia in intensive care units. Int J Antimicrob Agents. 2008;32(suppl 2):S87–S91. Efird MM, Rojas MA, Lozano JM, et al. Epidemiology of nosocomial infections in selected neonatal intensive care units in Colombia, South America. J Perinatol. 2005;25(8):531–536. Pfaller MA, Diekema DJ. Rare and emerging opportunistic fungal pathogens: concern for resistance beyond Candida albicans and Aspergillus fumigatus. J Clin Microbiol. 2004;42(10):419–4431. Charlier C, Hart E, Lefort A, et al. Fluconazole for the management of invasive candidiasis: where do we stand after 15 years? J Antimicrob Chemother. 2006;57(3):384–410. Spellberg BJ, Filler SG, Edwards JE. Current treatment strategies for disseminated candidiasis. Clin Infect Dis. 2006;42(2):244–251. Rex JH, Rinaldi MG, Pfaller MA. Resistance of Candida species to fluconazole. Antimicrob Agents Chemother. 1995;39(1):1–8. Pfaller MA, Messer SA, Hollis RJ, Jones RN. In vitro activities of posaconazole (Sch 56592) compared with those of itraconazole and fluconazole against 3,685 clinical isolates of Candida spp. and Cryptococcus neoformans. Antimicrob Agents Chemother. 2001;45(10):2862–2864. Pandey R, Ahmad Z, Sharma S, Khuller GK. Nano-encapsulation of azole antifungals: potential applications to improve oral drug delivery. Int J Pharm. 2005;301(1–2):268–276. Nogueira de Assis D, Mosqueira VC, Carneiro Vilela JM, Spangler Andrade M, Nascimento Cardoso V. Release profiles and morphological characterization by atomic force microscopy and photon correlation spectroscopy of 99mTechnetium-fluconazole nanocapsules. Int J Pharm. 2008;349(1–2):152–160. Di Bonaventura G, Spedicato I, Picciani C, D’Antonio D, Piccolomini R. In vitro pharmacodynamic characteristics of amphotericin B, caspofungin, fluconazole, and voriconazole against bloodstream isolates of infrequent Candida species from patients with hematologic malignancies. Antimicrob Agents Chemother. 2004;48(11):4453–4456. Maheshwari RGS, Tekade RK, Sharma PA, et al. Ethosomes and ultradeformable liposomes for transdermal delivery of clotrimazole: a comparative assessment. Saudi Pharm J. 2012;20(2):161–170. Prajapati V, Jain A, Jain R, Sahu S, Kohli DV. Treatment of cutaneous candidiasis through fluconazole encapsulated cubosomes. Drug Deliv Transl Res. 2014;4(5–6):400–408. Pinto Reis C, Neufeld RJ, Ribeiro AJ, Veiga F. Nanoencapsulation I. Methods for preparation of drug-loaded polymeric nanoparticles. Nanomedicine. 2006;2(1):8–21. Vieira DB, Carmona-Ribeiro AM. Cationic nanoparticles for delivery of amphotericin B: preparation, characterization and activity in vitro. J Nanobiotechnology. 2008;6(6):1–13. Gaumet M, Vargas A, Gurny R, Delie F. Nanoparticles for drug delivery: the need for precision in reporting particle size parameters. Eur J Pharm Biopharm. 2008;69(1):1–9. Bala I, Hariharan S, Kumar MR. PLGA nanoparticles in drug delivery: the state of the art. Crit Rev Ther Drug Carrier Syst. 2004;21(5):387–422. Bian X, Liang S, John J, et al. Development of PLGA-based itraconazole injectable nanospheres for sustained release. Int J Nanomedicine. 2013;8:4521–4531. Van de Ven H, Paulussen C, Feijens PB, et al. PLGA nanoparticles and nanosuspensions with amphotericin B: potent in vitro and in vivo alternatives to Fungizone and AmBisome. J Control Release. 2012;161(3):795–803. Kwon H-Y, Lee J-Y, Choi S-W, Jang Y, Kim J-H. Preparation of PLGA nanoparticles containing estrogen by emulsification–diffusion method. Colloids Surf A Physicochem Eng Asp. 2001;182(1):123–130. Li Y, Pei Y, Zhang X, et al. PEGylated PLGA nanoparticles as protein carriers: synthesis, preparation and biodistribution in rats. J Control Release. 2001;71(2):203–211. Zhang N, Chittasupho C, Duangrat C, Siahaan TJ, Berkland C. PLGA nanoparticle – peptide conjugate effectively targets intercellular cell-adhesion molecule-1. Bioconjug Chem. 2008;19(1):145–152. Kim I-S, Lee S-K, Park Y-M, et al. Physicochemical characterization of poly(L-lactic acid) and poly(D,L-lactide-co-glycolide) nanoparticles with polyethylenimine as gene delivery carrier. Int J Pharm. 2005;298(1):255–262. Shau MD, Shih MF, Lin CC, et al. A one-step process in preparation of cationic nanoparticles with poly(lactide-co-glycolide)-containing polyethylenimine gives efficient gene delivery. Eur J Pharm Sci. 2012;46(5):522–529. Bivas-Benita M, Romeijn S, Junginger HE, Borchard G. PLGA-PEI nanoparticles for gene delivery to pulmonary epithelium. Eur J Pharm Biopharm. 2004;58(1):1–6. Wang H, Zhao Y, Wu Y, et al. Enhanced anti-tumor efficacy by co-delivery of doxorubicin and paclitaxel with amphiphilic methoxy PEG-PLGA copolymer nanoparticles. Biomaterials. 2011;32(32):8281–8290. Liang GF, Zhu YL, Sun B, et al. PLGA-based gene delivering nanoparticle enhance suppression effect of miRNA in HePG2 cells. Nanoscale Res Lett. 2011;6(1):1–9. Chen J, Hessler JA, Putchakayala K, et al. Cationic nanoparticles induce nanoscale disruption in living cell plasma membranes. J Phys Chem B. 2009;113(32):11179–11185. Tiyaboonchai W, Woiszwillo J, Middaugh CR. Formulation and characterization of amphotericin B-polyethylenimine-dextran sulfate nanoparticles. J Pharm Sci. 2001;90(7):902–914. Winnicka K, Sosnowska K, Wieczorek P, Sacha PT, Tryniszewska E. Poly(amidoamine) dendrimers increase antifungal activity of clotrimazole. Biol Pharm Bull. 2011;34(7):1129–1133. Winnicka K, Wroblewska M, Wieczorek P, Sacha PT, Tryniszewska E. Hydrogel of ketoconazole and PAMAM dendrimers: formulation and antifungal activity. Molecules. 2012;17(4):4612–4624. Moazeni M, Kelidari HR, Saeedi M, et al. Time to overcome fluconazole resistant Candida isolates: solid lipid nanoparticles as a novel antifungal drug delivery system. Colloids Surfaces B Biointerfaces. 2016;142:400–407. Füredi P, Kovács K, Ludányi K, Antal I, Klebovich I. Development and characterization of voriconazole loaded nanoparticles for parenteral delivery. Int J Pharm. 2016;510(1):159–163. Ling X, Huang Z, Wang J, et al. Development of an itraconazole encapsulated polymeric nanoparticle platform for effective antifungal therapy. J Mater Chem B. 2016;4(10):1787–1796. Goa KL, Barradell LB. Fluconazole. Drugs. 1995;50(4):658–690. Cohen-Sela E, Chorny M, Koroukhov N, Danenberg HD, Golomb G. A new double emulsion solvent diffusion technique for encapsulating hydrophilic molecules in PLGA nanoparticles. J Control Release. 2009;133(2):90–95. Cohen-Sela E, Rosenzweig O, Gao J, et al. Alendronate-loaded nanoparticles deplete monocytes and attenuate restenosis. J Control Release. 2006;113(1):23–30. Rivera PA, Martinez-Oharriz MC, Rubio M, Irache JM, Espuelas S. Fluconazole encapsulation in PLGA microspheres by spray-drying. J Microencapsul. 2004;21(2):203–211. Thomasin C, Corradin G, Men Y, Merkle HP, Gander B. Tetanus toxoid and synthetic malaria antigen containing poly(lactide)/poly(lactide-co-glycolide) microspheres: importance of polymer degradation and antigen release for immune response. J Control Release. 1996;41(1–2):131–145. Mosmann T. Rapid colorimetric assay for cellular growth and survival: application to proliferation and cytotoxicity assays. J Immunol Methods. 1983;65(1–2):55–63. IUPAC. Compendium of Chemical Terminology. Zürich: IUPAC; 1997. CLSI Reference Method for Broth Dilution Antifungal Susceptibility Testing of Yeasts Approved Standard. CLSI Doc M27-A3. Third ed. Wayne, PA: Clin Lab Stand Inst; 2008. Canton E, Pemán J, Viudes A, Quindós G, Gobernado M, Espinel-Ingroff A. Minimum fungicidal concentrations of amphotericin B for bloodstream Candida species. Diagn Microbiol Infect Dis. 2003;45(3):203–206. Gibaldi M, Feldman S. Establishment of sink conditions in dissolution rate determinations. Theoretical considerations and application to nondisintegrating dosage forms. J Pharm Sci. 1967;56(10):1238–1242. Pfaller MA, Bale M, Buschelman B, et al. Quality control guidelines for National Committee for Clinical Laboratory Standards recommended broth macrodilution testing of amphotericin B, fluconazole, and flucytosine. J Clin Microbiol. 1995;33(5):1104–1107. Maebashi K, Niimi M, Kudoh M, et al. Mechanisms of fluconazole resistance in Candida albicans isolates from Japanese AIDS patients. J Antimicrob Chemother. 2001;47(5):527–536. Rex JH, Pfaller MA. Has antifungal susceptibility testing come of age? Clin Infect Dis. 2002;35(8):982–989. Vij N, Min T, Marasigan R, et al. Development of PEGylated PLGA nanoparticle for controlled and sustained drug delivery in cystic fibrosis. J Nanobiotechnology. 2010;8:1–18. Hanaor D, Michelazzi M, Leonelli C, Sorrell CC. The effects of carboxylic acids on the aqueous dispersion and electrophoretic deposition of ZrO2. J Eur Ceram Soc. 2012;32(1):235–244. Mosqueira VC, Legrand P, Barratt G. Surface-modified and conventional nanocapsules as novel formulations for parenteral delivery of halofantrine. J Nanosci Nanotechnol. 2006;6(9–10):3193–3202. Mosqueira VC, Legrand P, Pinto-Alphandary H, Puisieux F, Barratt G. Poly(D,L-lactide) nanocapsules prepared by a solvent displacement process: influence of the composition on physicochemical and structural properties. J Pharm Sci. 2000;89(5):614–626. Aoki H, Tottori T, Sakurai F, Fuji K, Miyajima K. Effects of positive charge density on the liposomal surface on disposition kinetics of liposomes in rats. Int J Pharm. 1997;156(2):163–174. Okon EU, Hammed G, Abu P, et al. In-vitro cytotoxicity of polyethyleneimine on HeLa and vero cells. Int J Innov Appl Stud. 2014;5(3):192–199. Lv H, Zhang S, Wang B, Cui S, Yan J. Toxicity of cationic lipids and cationic polymers in gene delivery. J Control Release. 2006;114(1):100–109. Fischer D, Bieber T, Li Y, Elsässer HP, Kissel T. A novel non-viral vector for DNA delivery based on low molecular weight, branched polyethylenimine: effect of molecular weight on transfection efficiency and cytotoxicity. Pharm Res. 1999;16(8):1273–1279. Nirmala MJ, Mukherjee A, Chandrasekaran N. Improved efficacy of fluconazole against candidiasis using bio-based microemulsion technique. Biotechnol Appl Biochem. 2013;60(4):417–429. Zhao S, Du Q, Cao D. Preparation of liposomal fluconazole gel and in vitro transdermal delivery. J Chinese Pharm Sci. 2007;16:116–118. Habib FS, Fouad EA, Abdel-Rhaman MS, Fathalla D. Liposomes as an ocular delivery system of fluconazole: in-vitro studies. Acta Ophthalmol. 2010;88(8):901–904. Calabrese EC, Castellano S, Santoriello M, et al. Antifungal activity of azole compounds CPA18 and CPA109 against azole-susceptible and -resistant strains of Candida albicans. J Antimicrob Chemother. 2013;68(5):1111–1119. Manavathu EK, Cutright JL, Chandrasekar PH. Organism-dependent fungicidal activities of azoles. Antimicrob Agents Chemother. 1998;42(11):3018–3021. Rogers TR. Antifungal drug resistance: limited data, dramatic impact? Int J Antimicrob Agents. 2006;27(suppl 1):S7–S11. Henriques M, Azeredo J, Oliveira R. Adhesion of Candida albicans and Candida dubliniensis to acrylic and hydroxyapatite. Colloids Surfaces B Biointerfaces. 2004;33(3–4):235–241. Vieira DB, Carmona-Ribeiro AM. Cationic lipids and surfactants as antifungal agents: mode of action. J Antimicrob Chemother. 2006;58(4):760–767. Tao C, Ting-li L, Zhang Y, Jing-guo F. In vitro antifungal activity of synthetic cationic polyethylenimine alone and in combination with three conventional antimicrobial agents against Candida albicans isolates. Chinese J Antibiot. 2007;8:511–514.